The Conejos is the largest tributary of the Rio Grande and flows from Platoro Reservoir through a spectacular valley above the town of Antonito, Colorado. There is a lot of public water here and some private. Best fishing is from the end of runoff (usually late June) through mid-October. There are some nice fish here both Brown and Cuttbows. Fishing nymphs or dries can be productive from June to October. The Conejos drainage usually has a lot of runoff so it clears later than most of our other streams. 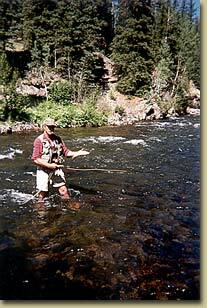 The river clears by early July and the dry fly fishing is excellent through August. Large dries are the ticket here; Stones, Caddis and Hoppers all produce well. Put a dropper 12" to 14" inches below the floater if things get slow. *If our dry, mild winter continues the Conejos could clear up to 2 to 3 weeks earlier making June a good bet. BWO = "Blue Winged Olive"
PMD = "Pale Morning Dun"